The Hamilton Echelle Spectrograph is a high-resolution optical spectrometer permanently mounted in a thermally and mechanically stable, semi-underground room at the coudé focus of the Shane 3-meter Telescope. The 0.6-meter Coudé Auxiliary Telescope (CAT) provides an auxiliary feed which permits the Hamilton to be used when the 3-meter is not configured for coudé observing. 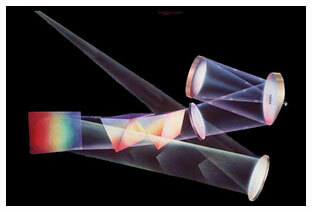 The Hamilton's spectral format covers a practical wavelength range from about 3400A-9000A in a single observation. Dispersion varies from less than 2.0A/mm at 3500A, to just over 5.0A/mm at 9000A; resolution ranges from about 60,000-100,000, depending on the choice of detector and other variables. As of the first quarter 2012 (beginning 1 February 2012) the dewar 4 CCD is the only detector available for use with the Hamilton Spectrograph. Dewars 6 and 8 have effectively been retired from service. The Hamilton Spectrograph is a Lick facility instrument, available to the University of California astronomical community by subscription. All new users must be checked out by a resident astronomer on their first night. Please request support on your time application. Please direct questions to a Mount Hamilton support astronomer. Email sa@ucolick.org or consult the support astronomers' on-call schedule.